Lucy is a lovely little lady looking for her forever home. Sadly, after being made homeless and moving back into the family home, the owner discovered that Lucy is not a fan of cats…at all! Unable to move anytime soon, it has been decided that a new home must be found for Lucy…without cats! 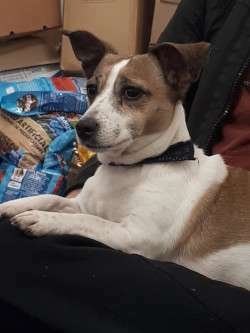 She is a sweet girl who loves a cuddle and a lap to sit on, she is quite timid and does like to bark at strangers coming into the home, however she quickly comes round with a few treats. She would make a lovely companion in a quieter adult home with someone who has plenty of time to give to her. Still with her owner, please speak to the rehoming team for more information.